Inez Bazata, 97, of Schuyler, died Wednesday, June 21, 2017, at the Columbus Community Hospital. Funeral Service Monday June 26, 2017 10:30 A.M.
Inez Laura Bazata was born August 22, 1919, near Howells, Nebraska to Paul and Augusta(Broekemeir) Renner. 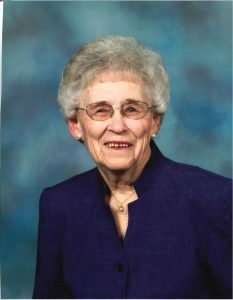 She attended District School #75 and St. John's Lutheran School in Howells. On August 19, 1941, she married Lumir Bazata in Howells. They lived and farmed near Howells until moving to Schuyler in 1979. When Lumir died in 1995 Inez enjoyed living in her home she loved so much, until recently when her health failed. Inez was a member of Trinity Lutheran Church, the Ladies Aid where she had served as Secretary and was a member of the CHI Memorial Hospital Auxiliary where she volunteered in the gift shop. She had made over a hundred quilts for Lutheran World Relief plus all the quilts she made with love, for her family members. Inez loved cooking, baking, canning and sewing. She enjoyed spending time with her children, grandchildren and great-grandchildren and was always happy to have friends stop by for coffee and one of her homemeade treats. Inez is survived by her children; Larry and Suzi Bazata of Omaha, Janet and Doug Spale of Columbus, Connie and Bob Pernicek of Schuyler and Michael and Deb Bazata of Olathe, Kansas. Also surviving are 13 grandchildren, 33 great-grandchildren and many nieces and nephews. She was preceded in death by her parents, husband, an infant son, grandson Scott Spale and three sisters and a brother; Ruth(Herman) Eckert, Olga(Alvin) Eggers, Lucille(Leonard) Hejtmanek and Harlan(Eileen) Renner.